Sad reading that isn't it. Like so much of the town, we just don't see enough of it. Everyone loves Bedford Falls, and as stated upon the launch of this blog, its the town that gives the movie a lot of its lasting appeal and soul as a film. 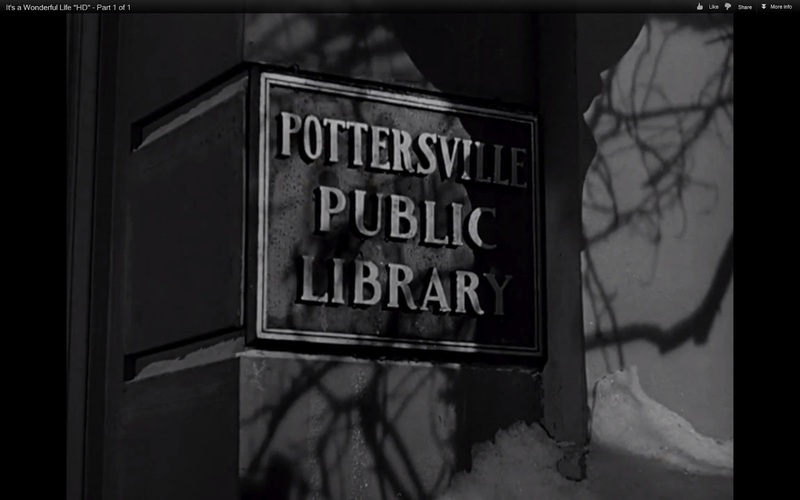 Like the travel agency, we do not see the Library in Bedford Falls, only the Pottersville version. George hears from Clarence where the WOG (With Out George) dimension Mary Hatch is. She's closing up the towns library and George apparently know where this is, which tells us that the library location was there before George's birth and has remained in the same place. Why do they have the same sign posted on each side. No smoking! Our limited time seeing the building places it on main street as George watches Mary close it up. 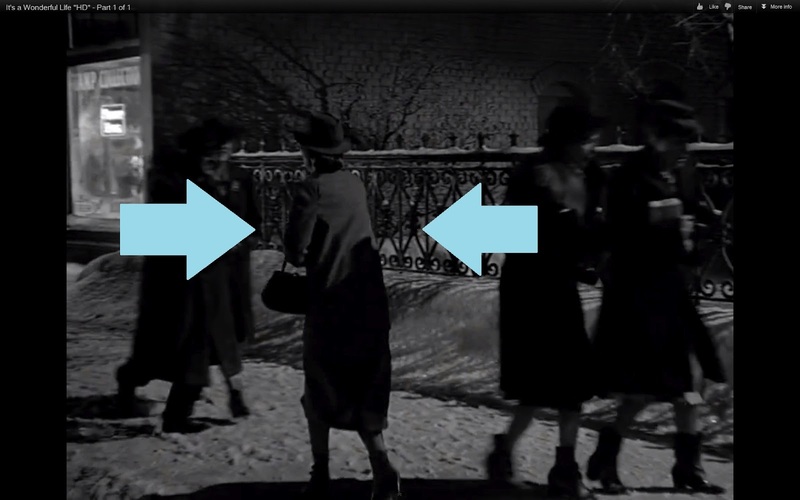 Apparently its very close to the court house at the end of main street as after following Mary for a short while and George is forced to run away, you see the end of the street and the town court house in the distance as George runs toward the Pottersville (Bedford Falls) sign area. Mary Hatch for some reason never married with out George being in the picture. She must have came home from the university and became the town librarian or something. She's dedicated as we have another example of someone working late on CHRISTmas eve! She either must have spurned Sam Wainwrights advances or perhaps her change in ... well appearance due to her sheltered life may have not kept with Sam's taste. Example of Wainwright's type. How do you spell floozy! And he even later married a blonde. Mary as she is without finding George. She looks more like an old bag lady than the lovely Mary Hatch Bailey we know and treasure. The difference in Mary is really quite remarkable. The make up artists and wardrobe people really outdid themselves in the simple transformation. We know Mary fell in love with George as a young girl, and without that first love her life must have taken quite the shift. Mary Hatch with George in her life. Perfection! Can you read the water tower line? 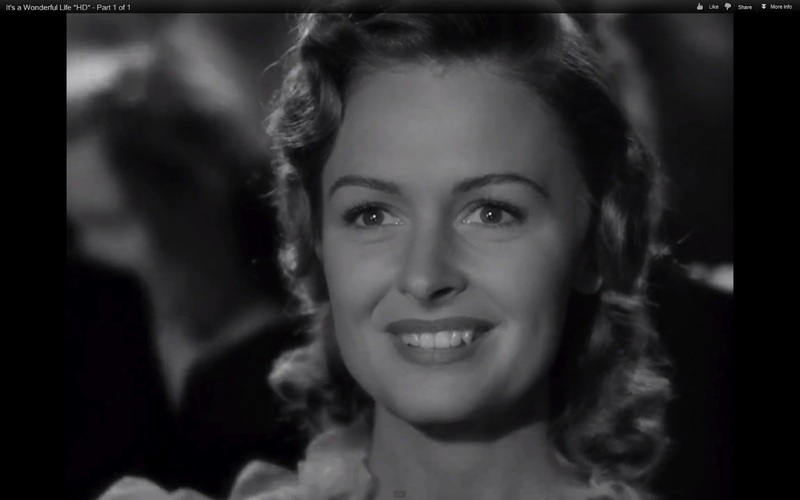 Of course Mary is absolutely stunning and beautiful and that's not hard to do when she's being played by the ever beautiful Donna Reed. 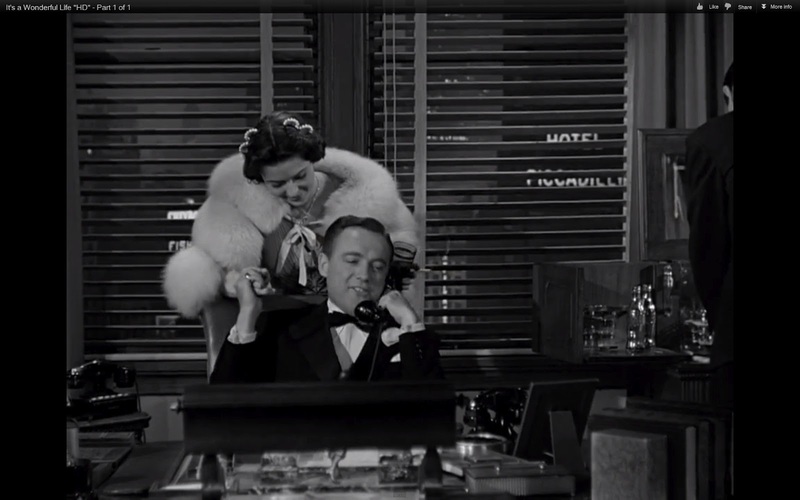 Donna is famous for many films and many things, but like many of this cast she's best and always remembered for her perfect casting as Mary Hatch. 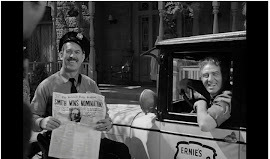 It is said that Capra had in mind a few other actresses such as Capra favorite Jean Arthur, and while l love Jean I cringe at the thought of her playing Mary. Reed is the real life example of the perfect small town girl as she's from the tiny Iowan town of Denison which knows just who is their famous patron. (See right). Donna won an academy award in 1953 for her role as a very un Mary like woman in From Here to Eternity. She then had an amazing run on television with the beloved Donna Reed Show which ran for almost a decade. 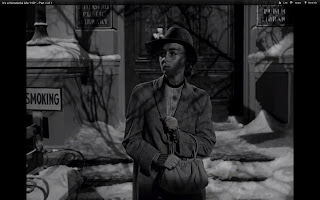 The shows lovely CHRISTmas episode (featuring an older Buster Keaton) can be watched online. 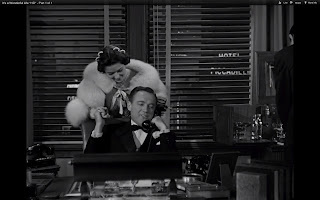 She stared in various movies (including one I can't resist another plug at in The Human Comedy! )and took ever decreasing roles in her later years finally ending with a problematic run of episodes on Dallas before retiring but not from performing. 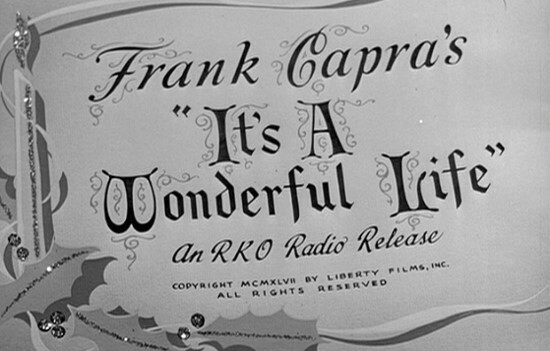 Here is her giving a tribute to Frank Capra in 1982. Donna Reed passed away not long after from Pancreatic cancer far to young at just 65 in 1986. There is a foundation set up that I would encourage everyone to take a look at at least once. The website is located at http://www.donnareed.org/ RIP Donna, one amazing woman. 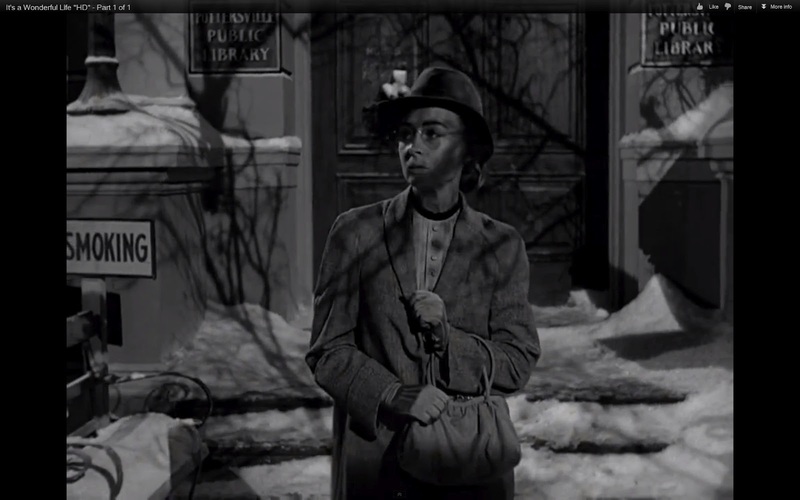 Returning to the library and Mary, I can't help but use that as just another excuse to love Mary all the more. 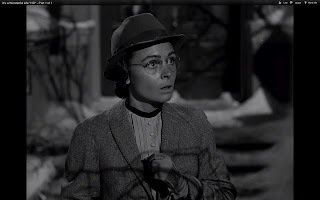 As a book nut, seeing and assuming that Mary must have been one as well just puts icing on the cake for who my favorite classic actress is. It's unfortunate that we don't see the building but from what the limited shots show I think Enesco simply decided to go with an entirely original design versus following the film. Something they did far too often but in this case results in one of the prettiest buildings of the entire collection. Coming from the 4th and best of all the village series here is the Enesco Bedford Falls Library. Enesco Bedford Falls Library: Front face. Click below on 'Read More' to see all the images. Again this is just one of the four examples of why the 4th series is the best. Fantastic job by Enesco on this one. 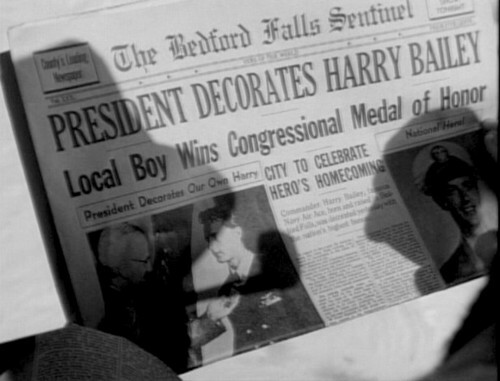 Enesco Bedford Falls Library: Top. Question, has the snow started to melt? Why do some of the village roofs have tons of snow while some little or just bits? Enesco Bedford Falls Library: I like the wood grain on the steps. Enesco Bedford Falls Library: Yeah I'm obsessed with CHRISTmas! Enesco Bedford Falls Library: Large fires apparently in this library? And as lit up. No surprises here.